The pump was serviced and all installation was cleaned and disinfected before reinstallation. A pumping test was then carried out to determine the yield and water quality was found to be excellent when tested in an approved laboratory. 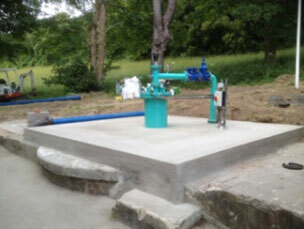 The client commissioned a new headworks and plinth for the borehole to bring it fully up to specification. The operation was carried out to exact specifications and completed in time with the agreed programme of works. The client was delighted that they now had a rejuvenated borehole yielding top quality water and modified to current standards. Drilcorp completes Dewatering project in Record Time!